Mexico, 1531 was a candle I couldn’t resist reviewing. It sounded so vintage and unique which are candles I always appreciate and love to highlight on Candlefind. The candle itself was really pretty and had a luxury feel to it. 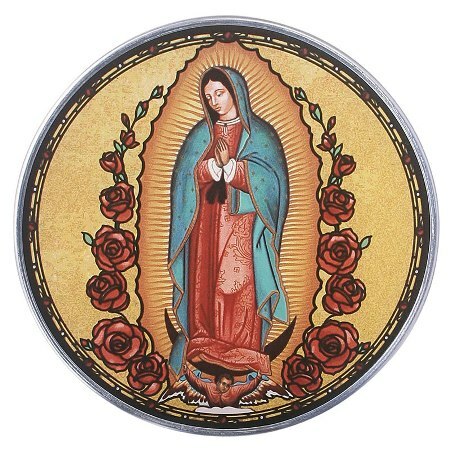 The vessel was a heavy whisky style glass with a gold embossed image of The Lady Guadalupe, which is the Spanish term for the Blessed Virgin Mary. Presentation definitely had a Spanish feel to it and I thought was very well done. Mexico, 1531 candle weaves Damask (also known as Castilian) rose with the cool, mineral scent of fresh soil. 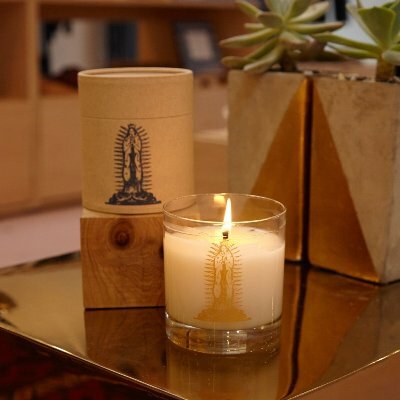 Stores that burn the Mexico, 1531 candle report that it has literally drawn people in off the street, and many loyal customers claim it is their go-to candle when they want to feel grounded and calm. The slogan “love the air you breathe” was penned on Instagram by a store owner who fell in love with the fragrance. Great and detailed scent description! First impression…. The fragrance indeed smelled like an earthy rose, not a classic sweet and heavy rose which I was very thankful for. Classic rose scents and I generally do not get along so this candle would have been short lived in my home had it been. I was also curious to see how well my husband would tolerate it. With floral scents, he is the first to tell me when he can’t handle something and rose is at the top of that list. With the earthy/soil element present, would he notice? I decided to be daring and light this candle in my master bedroom. Go big or go broke right? Besides, I was dying to see what my husband would think of this fragrance. Luckily, I lit it hours before he got home, giving me a chance to enjoy and critique it without hearing his comments. It’s a good thing I did…. but first, what did I think? I thought it was beautiful… and very different. Once the wick was lit, it took a good hour to reach a full melt pool but the fragrance was moving throughout my bedroom long before that and it was quite lovely for a rose scent. The aroma was just as the description boasted… a very beautiful rose that definitely dominates overall but the earthy element blended in really tones it down. My entire bedroom smelled like a lovely and soothing rose with an added aspect I couldn’t really describe. It’s supposed to be “earthen soil” but it was hard to tell. Whatever it was, it was perfect. And just an FYI… I am not a fan – at all – of rose but this candle I seemed to tolerate quite nicely. That really speaks volumes to the blending of this candle. Now, what did my husband think? True to form, he did not like it. At all. The moment he got home, I smirked and waited for his reaction. Tick, tick, tock… not even five minutes in, he came out of our bedroom and wrinkled his nose and immediately said he smelled a rose perfume and asked me how long he had to endure it. LOL!! Some husbands… they never truly appreciate the quality of a candle. I told him at least a few days which is exactly how long it burned. And guess what? He survived. ? Strength – I would rate this candle a 10 in any size room. It was very strong. Not head ache inducing strong but you definitely smell it wherever you are quite loud and clear. This candle burned perfect. No wick issues. Clean burning from start to finish. Mexican, 1531 was a beautiful candle I recommend to all you floral lovers out there, especially if you love the scent of rose. It’s one of a kind too and the only one made by this company. That’s how much they love and believe in this fragrance. It is pricy at $48 but if you’re in the mood to treat yourself to something unique and special… this is the candle to try.